Joseph Decuis has long been our favorite special occasion spot, but because of the prices, which are totally worth it, we don’t get there as often as we’d like. That is until last summer when Chef Aaron Butts introduced Blue Jeans, Burgers, & Beer, a casual Friday night dinner, featuring an ever-changing menu offered in the courtyard from 5 to 8 PM throughout the summer. It quickly became our favorite dining experience and it’s back this summer! 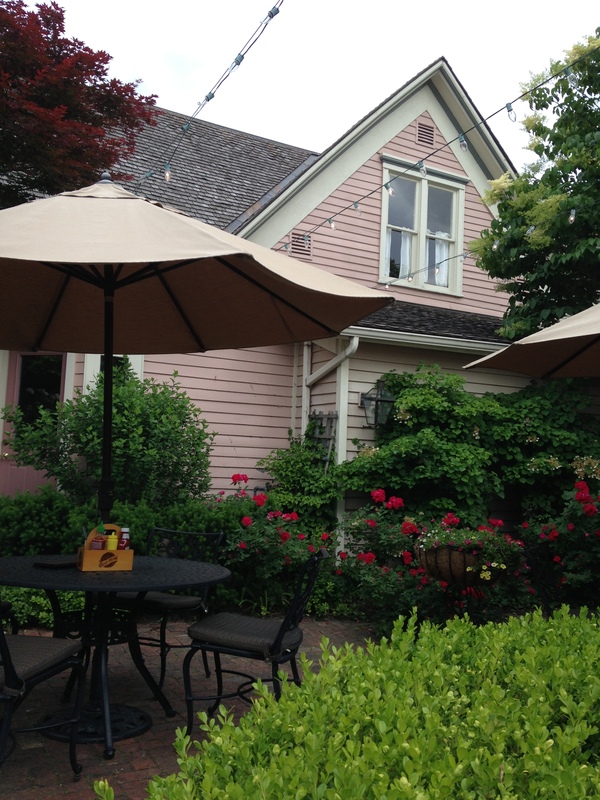 The courtyard at Joseph Decuis is quaint and cozy and the food is right on par with what we’ve come to expect…exquisite! And yes, you can wear jeans! On our first trip last summer, we tried the BBQ Pork Banh Mi and the Wagyu Burger. Both were prepared perfectly. The BBQ Pork Banh Mi was packed with the perfect combination of Vietnamese flavors and spices, and the Wagyu Burger was out of this world. If you’ve never had Wagyu, I highly recommend you try one of these burgers. It’s an affordable way to sample the beef, and you won’t regret it. The beef is locally raised, all-natural, and hormone and drug free, and the flavor is unmatched. On our second trip last summer, we took my parents and sampled the basket of fries, the Grilled Wagyu Steak Kabobs, and the Andouille Sausage Po Boy. The fries were sensational. I don’t know what they put on them, but we could not stop eating them even though they came out of the kitchen piping hot. And the Wagyu K abob? Whoa! It may be the best thing I’ve ever eaten. The meat was cooked just right and was drenched in a delectable chimichurri sauce, served on top of grilled vegetables, black beans and rice, and finished with an avocado cream. The Andouille Sausage Po Boy carried just the right amount of heat to keep me going back for more. I talked to Aaron about his menu for the kick off event last week and here’s what he was serving up: Duroc Ribs, Smoked Hawkins Farm Chicken, Wagyu Burgers, Mac n Cheese, Gumbo, Indiana Asparagus Salad & a special Wagyu Burger topped with Poblano-Ham Hock Chili, Guacamole and Chipotle Aioli. He also assured me he would have plenty of craft beers on tap and special cocktails as well. 2- Leave a comment telling me why you want to go. You must do both in order to be entered to win. I will announce the winners on Friday morning. My wife and I have never been to Joseph Decuis and have heard many great things about their food. My wife And I have never been to Joseph Decuis and would love to try it. We have heard many great things about their food! I have never been and have wanted to go for quite awhile now. I would love to give it a try as I am pretty adventurous with trying new foods! I didn’t get to any of these last year and I feel like a jerk for missing such a cool thing. Plan to attend this summer. I need more Joseph Decuis in my life (we all do) and I was unaware of these awesome Friday night(s) happenings. Must go for those of you who haven’t been. Unbelievable food. Unmatched in the area. This looks amazing! It would be a perfect night out from a stressful week! I’ve heard about this event since Decuis started it, and always thought it sounded like a wonderful evening out. Who *wouldn’t* want an excuse to visit Roanoke? It’s a neat little town. It’s been ages since I’ve been there and this is the perfect excuse. That and my daughter now lives a block away in the Nook! This sounds like a delightful evening! We would enjoy a nice night out with wonderful food and atmosphere! I will wear jeans and nothing else. Just try to look away Chef Butts. I have been wanting to go for sometime now, and was actually just discussing how we need to over a bonfire the other night. I love gourmet food and I have heard great things about Joseph Decuis and Chef Aaron Butts! Wining this gift certificate would give our budget extra assistance to enjoy a lovely evening on the patio. I have always wanted to go to this restaurant! Would be nice to experience it in a relaxed fashion…ride the HD out with the wife and not be out of place! Simply, I’m working in Tacoma this summer and this will be a #PerfectDateNight for Paulette during one of my infrequent weekend trips back to Indiana. Love JC!!! Would love to go! Mother’s Day plans got cancelled due to two sick kiddos! We need a night out! We would love to be able to come to your restaurant after all of the incredible reviews we have heard. It would be a much needed break from the stresses of our lives right now, and would be a great way to kick off the summer. Thank you for the opportunity! Amber, thank you so much for posting about this! What a treat this would be — for anyone! So glad I found your blog! Joseph Decuis is solo on my bucket list! Would love a chance to go! Ryan and I need some fancy food in our lives. Too much fast food recently! I’d love to win to be able to go for a date night with my wife. I’m a die hard foodie- love everything from fancy foams to foie gras, but my boyfriend tends to be less adventurous. He is, however, active in the Indiana craft beer scene. This sounds like a great way to appease the both of us! Add to that the fact we have just had our first child on April 22 and a midsummer Friday night date sounds divinely indulgent! Thanks for your consideration. I had already decided this is how we’re celebrating my upcoming birthday, a gift certificate would just make it that much better! 🙂 I was bummed not to make it to any last year. Now I’m hungry and simply must go! I have never been which is a shame because one of my friends is a chef there 🙂 I would love to go!! Well, duh. Who wouldn’t want a gift certificate from Joseph Decuis? Oh, and my birthday is in May too! I surely love any chance I get to visit Joseph Decuis – the food is always extraordinary, the selection of beverages well above par (including some bourbons and american whiskeys I simply cannot get anywhere else), and I have to imagine that Aaron Butts would make pretty much the best burger I’ve ever had. I kicked myself for not attending one of these last summer, so I am quite happy to see that they are doing them again this summer. Regardless of a gift certificate or not, I vow to make it to Roanoke for BB&B this year. I swell with pride knowing that there is such a fine establishment and chef in our area and a community that supports the wonderful things they do. My chef partner is going to apprentice there next to one of his best friends, and yet he has never eaten there! I would like to change that for him as he has stood by me through a lot lately. I grew up running around Roanoke. Our adult son took us here once and I would LOVE to go back! Great article. Glad to know there are more relaxed Friday options. I love learning of fun alternatives for date night. I have heard about this restaurant from many many friends. I think I have now been thoroughly convinced that this is a place I must try and likely do so over and over. I’ve never been to Joseph Decuis, though I would love to go! I might have to check out this Friday night thing – even if I don’t win. I am never disappointed. I only made it once last summer but hope to be back a few more times this summer. I love eating outdoors with friends, amazing food, and cold beer. Hoosier summers!! I’ve been wanting to try Joseph Decuis. Burgers & Blue Jeans makes it accessible for me. Would love to go this summer! My husband and I were married last May in JD’s beautiful courtyard. We love it there and have been big fans for the past several years. Our anniversary is on May 25th. 🙂 It’s a great time of year for us to go back! Congratulations Casey and Dana! You two have won the contest.